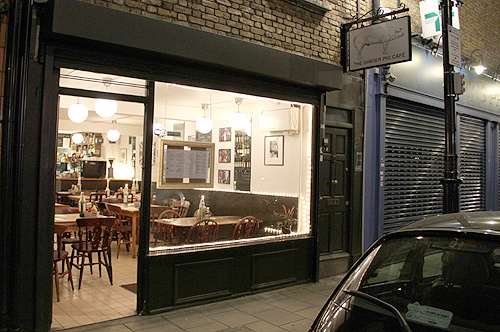 The Ginger Pig Cafe in Hoxton was reviewed recently by Burgerac who loved the place. I went along with some pals last night and enjoyed it too. 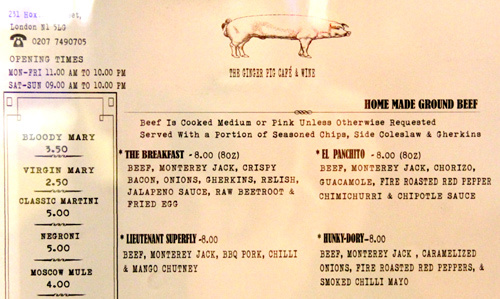 Surprisingly, this cafe has absolutely no affiliation with the Ginger Pig butchers. 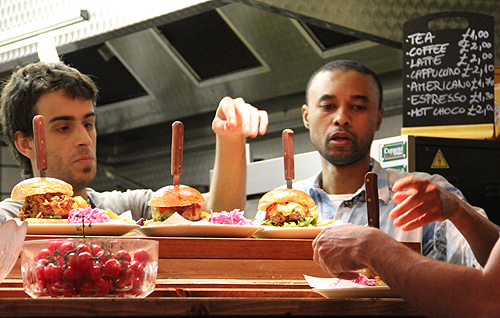 Their meat comes from a chap on the Essex road, and very decent it is too. 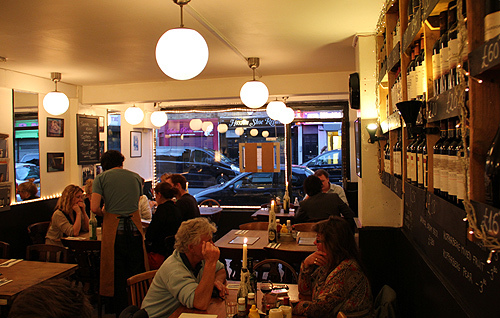 The interior is 'Bistro', the staff are friendly, there's a tranquil atmosphere and folks can be seen grinning as they tuck into slabs of pink steak. Oh is that Meantime Pale Ale i see on tap? Get in! Between the four of us, we ordered a couple of the waiter-recommended Hunky-Dory's, a Lieutenant Superfly and an El Panchito. 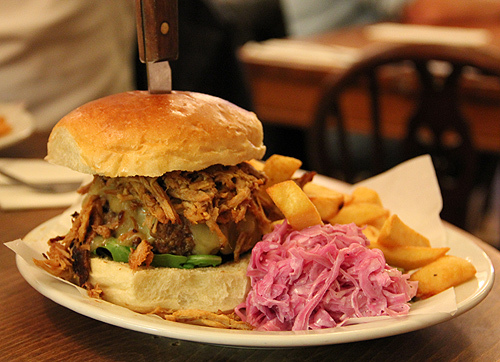 All burgers are £8 and come with chips, (street Kitchen-esque) coleslaw and gherkins - all of which are great. 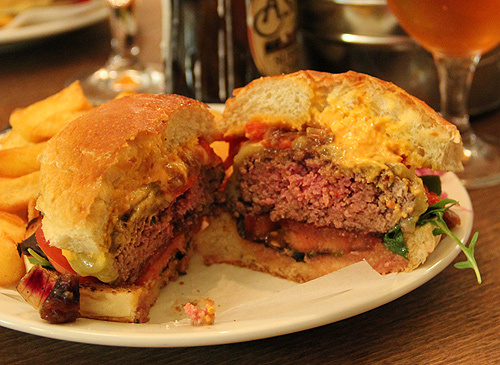 I had a Hunky-Dory which comes covered in melted Monterey Jack with caramelised onions, tomato, rocket, purple lettuce, smoked chilli mayo and the star ingredient: fire roasted red peppers. 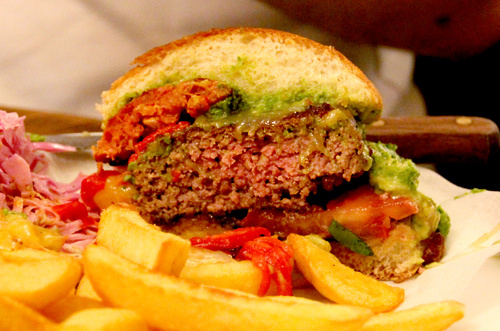 These peppers really made this burger something different. 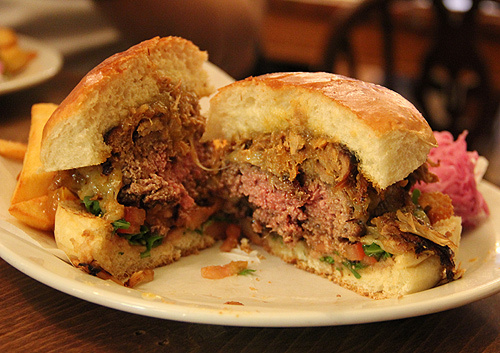 Its not a chilli burger as such as the heat level is minimal but the flavour of the roasted peppers worked perfectly with the beef making this a memorably tasty burger. The now default brioche bun was light, fresh and tasty. The only criticism was that all of us ordered medium-rare patties, and they all came much closer to medium. Still plenty flavourful, but lacking in that soft(er) juiciness we all like. Lets hope that the management haven't had the shits put up em concerns about the FSA guidelines since burgerac was there last month. This is a good little burger spot & the deserts are worth a go too.